This weekend I made a discovery - this is not the Forest Heather colorway of Shadow laceweight. This is Lost Lake. I ran across my colorcards from when Knitpicks first started doing their own yarn, which is when I ordered this yarn (I've stashed several projects worth of Knitpicks yarns over the last few years) and this is the Lost Lake colorway. (The reason I didn't know was because at some point, I had wound this into balls, the tags got separated from the balls and then I didn't end up starting whatever project I was thinking about after all.) I have no clue whether or not the current Forest Heather colorway is at all related to the old Lost Lake colorway and it is this old Lost Lake colorway that matches Elann's Forest Glade Heather colorway. 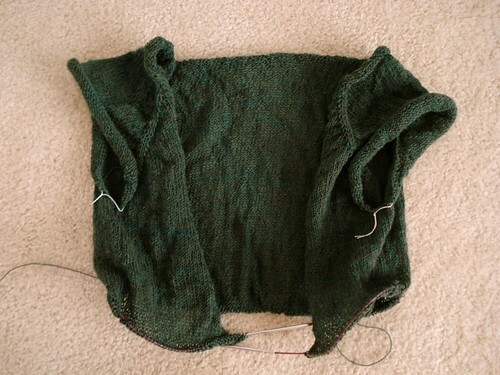 I'm still moving right along on the body of this sweater. It will definitely need a nice steaming to get all the wrinkles out after riding around in my purse, but it has worked out well as a "drag along" type of project. It's a good thing it's working as this type of project because I usually use socks for this same purpose. I reorganized my sock drawer yesterday, and it's stuffed!